One of the first things you would like to do when you connect to the Beaglebone Black is see that you are having an impact on the hardware. 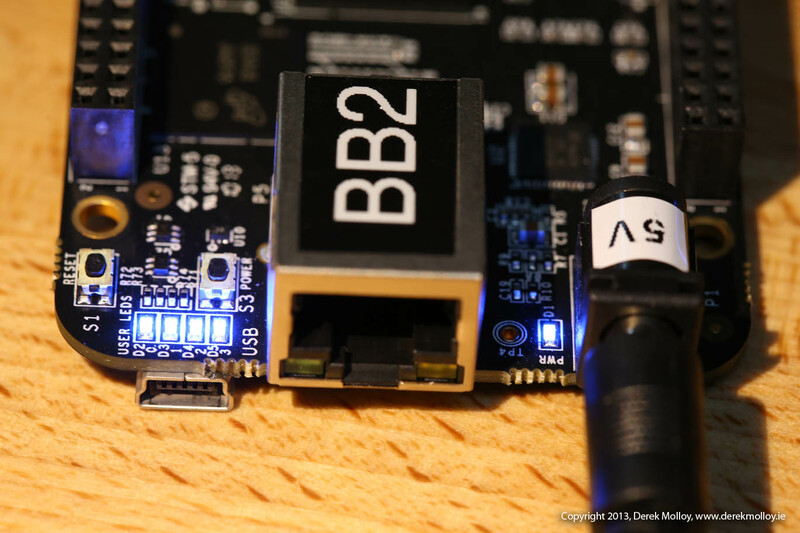 In this short post I am going to look at how you can change the behaviour of the Beaglebone on-board LEDs – the four (blue on the BBB) LEDs in the corner near the reset button. We can change the behaviour of these LEDs, but obviously we will temporarily lose this valuable information. The heartbeat tells you that the BBB is alive, which is always useful to know. The others are fairly self explanatory (the eMMC is the solid state memory that you are booting from). Sysfs is a virtual file system that is available under Linux that gives information and access to devices and drivers that would otherwise only be accessible in Kernel Space. It gives us a virtual file system in Linux User Space, which is convenient to use; however, it is not highly efficient. drwxr-xr-x 2 root root 0 Jan 1 00:00 .
drwxr-xr-x 48 root root 0 Jan 1 00:00 ..
You can see the four (green!) LEDs, usr0, usr1, usr2 and usr3 and their mappings. drwxr-xr-x 3 root root 0 Jan 1 00:00 .
drwxr-xr-x 6 root root 0 Jan 1 00:00 .. The first LED should go on. The first LED should go off. You have to set up the timer before writing to delay_on and delay_off. So the first line sets up a timer and on the second and third lines we set up the time for the first LED to be on and off (in milliseconds). So this will cause the first LED to flash 10 times per second (i.e. time on + time off = 100ms, so 10 flashes per second). It should go back to the heartbeat trigger. Now that we have this working at the command line it would be useful if we could write programs that interface to the LEDs in a similar fashion. My C++ implementation code is below. It uses the C++ fstream and iostream libraries to read and write data to the input/outputs using sysfs. cout << "Usage is makeLED and one of: on, off, flash or status"
#!/bin/bash echo "EE402 - Building the Test LED program on the Beaglebone Black" g++ makeLED.cpp -o makeLED echo "Finished"
echo "EE402 - Building the Test LED program on the Beaglebone Black"
remote: Counting objects: 52, done. remote: Compressing objects: 100% (43/43), done. Receiving objects: 100% (52/52), 33.71 KiB, done. Resolving deltas: 100% (19/19), done. drwxr-xr-x 2 root root 4096 Nov 20 23:24 .
drwxr-xr-x 7 root root 4096 Nov 20 23:24 .. The way we can interact with GPIOs is not much different than this; however, we have complexities to deal with to do with the Device Tree, and we have to use Device Tree Overlays. See my post: GPIOs on the Beaglebone Black using the Device Tree Overlays on this topic. Dr. Derek Molloy is a senior lecturer in the School of Electronic Engineering, Faculty of Engineering and Computing, Dublin City University, Ireland. He lectures at undergraduate and postgraduate levels in object-oriented programming with embedded systems, digital and analog electronics, and 3D computer graphics. His research contributions are largely in the fields of computer and machine vision, 3D graphics, embedded systems, and e-Learning. This is his personal blog site. Nice blog post, thanks a lot! There’s a tag in the git command that shouldn’t be there. Hi Derek, your website and the videos are extremely helpful. I was wondering if you had plans on adding videos on how to create a cluster computer with the Beaglebone black. I am very new to this concept, but I am very interested in learning more about parallel computing. Thanks, really appreciate your help. Notice the word “green” I put in there. Maybe this default file is a leftover from the BeagleBoard, but with the BeagleBone Black you have to add the “green” to the line for any effect since the user LED folder contains the word “green”. After a reboot, the heartbeat and SD card access LEDs are turned off, free to use for other purposes. Very nice blog indeed. Thanks for doing that! I’m just wondering if there is a faster way to program/set GPIO’s. Let’s say I have a special LCD and I have to fill the screen (320×240 res) under 30 ms. If I must ask a more generic question, how fast can I change/set a single GPIO state? Acraft, I would think the C++ program would execute pretty fast. Remember the CPU can do 2000 MIPS, that’s 2 billion instructions per second, and I guess a single line of C++ code is a few instructions each, so you get at least a couple hundred million lines of C++ executed every second. If my 100MHz scope had arrived yet, I would be happy to test this for you, but it should arrive in 2 weeks, and I can post results when I get it if you’d like. When I try to change the status of USR0 via the command line, I just get ‘No such file or directory.’ I am logged in as root on Angstrom. Any ideas? am really enjoying your book. however, have bumped into a issue around page 187. The makeLEDmulti file doesn’t really work. Even after re-reading the source code. Can’t find the error. But then again, still learning the C++ language. Tried re-compiling. Also didn’t work. both ./flashled and ./chp05/makeLEDmulti/flashled failed. not sure what happened. All the other stuff seems to work. Hi Lorcan, thanks for your support. For that example to work you MUST execute the build script (./build) in order to create the symbolic links in that directory (flashled, ledstatus, offled, and onled). You will see the links appear by using ls and then you can execute the script using sudo ./flashled (or any of the other commands). Hope that helps, Derek. Thanks, apparently have overlooked that file. Hey, Im very new to linux. I had problems executing the cpp programs you had given. I was not able to see the led behaviour on board. After I changed the command to sudo sh -c ‘./led on’ things started working.. Should I have to always use the prefix sudo sh -c ? Thanks in advance. Did you ever get around to write a book on how to use the GPIO, PWM and Analog I/O on the Beaglebone black in C++? I have some projects in mind and I am learning C++, but I find a bit hard to interface my knowledge in C++ with the Beaglebone (also because the BlackLib available is not so easy to understand for a beginner as I am). If so, what’s the title of the book? I would like to purchase a copy. Would you mind to reply also to my email? I wouldn’t like to lose the chance to get this book. Great tutorials and book Derek. I have a question or two about interfacing and controlling the hardware on the BBB Rev C under a user account instead of root. First, is it actually possible to control the USR LEDS or any other HW with an account other root? Doesn’t seem to work with a user account. When using the debugger in eclipse it wont hit breakpoints or actuate the hardware io either. Any suggestions? This c++ return an error at line 66. It looks like getline has invalid arguments. Hi, I have a question. I want to programmes gpio, i2c, … in c/c++. What’s the difference between you solution here and libs like blacklib? You don’t use it Lib like blacklib in your tutorial. You are only working with the standard environment libs, is that right? exploring BBB – following Your great Videos. so stepping through source is not possible. Do You have any ideas how to run the gdbserver on BBB in this case?